The T-80U is a Rank VII Soviet medium tank with a battle rating of 10.0 (AB/RB/SB). It was introduced in Update 1.87 "Locked On". Summarize and briefly evaluate the vehicle in terms of its characteristics and combat effectiveness. Mark its pros and cons in a bulleted list. Try not to use more than 6 points for each of the characteristics. Avoid using categorical definitions such as "bad", "good" and the like - they can be substituted with softer forms such as "inadequate" and "effective". Work on improving the existing T-80 MBT begun as early as the mid 1970s, with the design bureau in Leningrad, which was responsible for the production of the T-80, starting work on a joint project to further enhance the T-80’s capabilities. 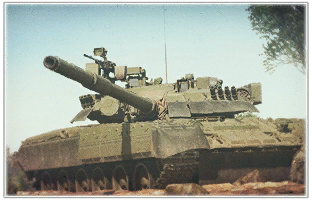 In the early 1980s, the first prototypes were being built, and after extensive testing and design tweaking, the new tank was considered ready for production and was accepted by the Soviet military under the designation T-80U. 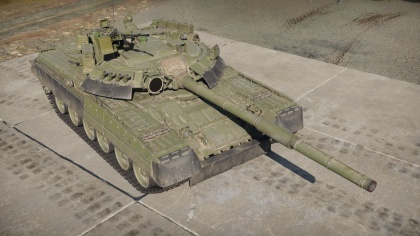 The T-80U received turret and upper frontal enhancements as part of its new construction, and was equipped with a second generation ERA protection system known as Kontakt-5. In contrast to the previous generation of dynamic protection, Kontakt-5 increased the tank's protection against HEAT and armour-piercing shells. The modifications also affected the armament of the tank - the T-80U is equipped with a new 1A45 fire control system and Reflex ICBM, which used more advanced 9M119 guided missiles. Subsequently, the tank was equipped with a new, more powerful GTD-1250 gas turbine engine which helped compensate for the increased weight of the vehicle and improved its dynamics. The T-80U had been factory produced in Leningrad in 1987, but in 1989, its production was moved to Omsk. Work on upgrading the T-80 was carried out in Kharkov, but there, they constructed their own vehicle equipped with a diesel engine, which was designated ‘T-80UD’. The latter would evolve into further developed Ukrainian derivatives of the T-80. T-80Us served with the Soviet military until the collapse of the Soviet Union in the late 1980s, and have since continued serving with the Union’s successor states to this day. The vehicle also saw service abroad with some other countries as well, primarily with South Korea and Cyprus. Overall, around 700 T-80Us have been produced since 1985, but the vehicle never saw any combat action. This page was last edited on 19 March 2019, at 16:53.